Meets EPA guidelines for recycled content and are suited to the industrial and educational markets. Made from 100 percent recycled material with 40 percent post-consumer material. Encourages faster washroom traffic and cleaner restrooms. 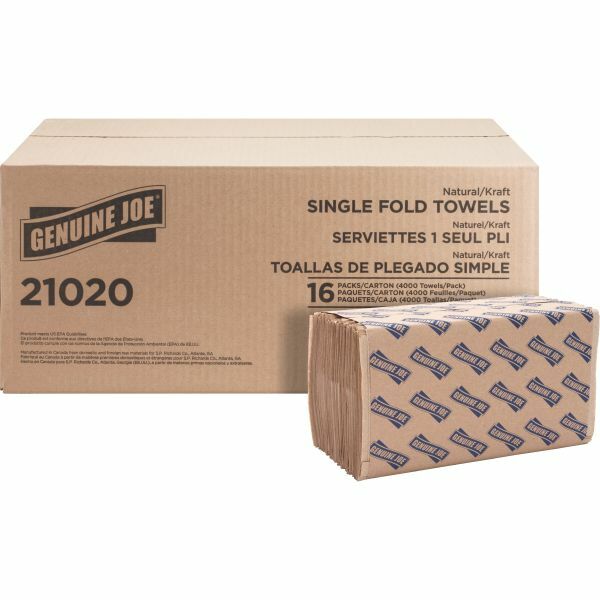 Genuine Joe Singlefold Paper Towels, 250 Sheets/ Pack, 16 Packs/ Carton - Single-Fold Towels provide the ideal balance of economy and performance. Natural single-fold towels meet EPA guidelines for recycled content and are suited to the industrial and educational markets. Folded towels encourage faster washroom traffic and cleaner restrooms. Hands-free dispensing is more sanitary and prevents cross-contamination. Deeply embossed design offers thickness and preferable feel. Ideal for public environments. Towels are made from 100 percent recycled material with 40 percent post-consumer material.